Be honest, everyone has thought/drooled over a full carbon fattie. 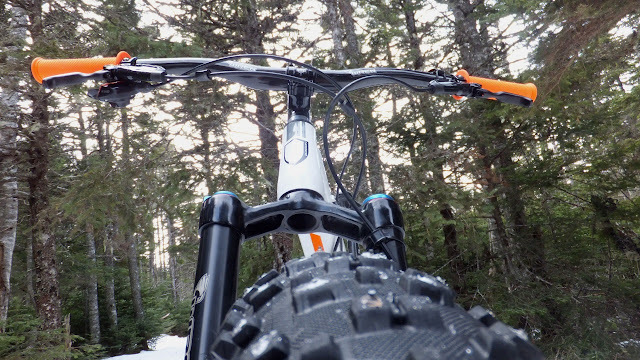 Swinging your leg over a bike that weighs less than five bags of sugar and blasting down the trails on something as light as air is really cool. 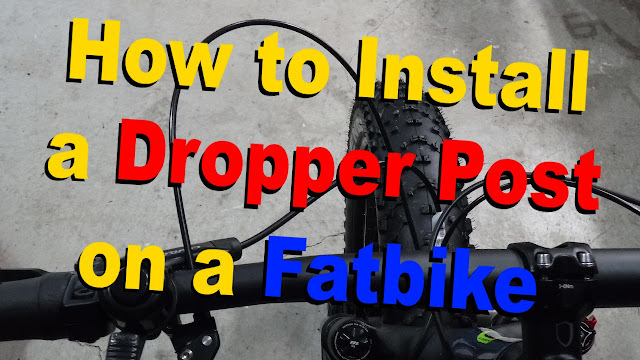 The major deterrent for carbon is the cost, so that is why the aftermarket offers all sorts of carbon bits and pieces for your fattie. From forks to frames, bars to seatposts, wheels to cranks . . . carbon bike parts add a little bling, reduces weight and provides benefits to the rider. 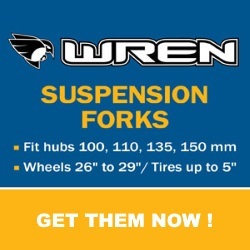 Wren Sports (known for their super slick inverted fatbike fork) in addition to their superlight alloy stems and other bike related accessories . . . also carry a selection of carbon goodies for the discerning biker. Fatbike Republic has collaborated with Wren Sports to take a closer look at their carbon bars and carbon seatpost, breathing some fresh air into a stock fatbike cockpit. Carbon is generally lighter than its aluminum counterparts. While you may be able to get comparable weight aluminum parts, the durability/longevity may be impacted. Carbon also offers more vibration damping over aluminum that will give your wrists/arms and back a well deserved break on non-suspended fatties. While some say that carbon can be more easily damaged from sharp impacts, it should be stronger overall for general trail riding as carbon is harder to bend/break than aluminum. And carbon quality has always been a concern as we have all heard stories of “no-name” carbon bits breaking at the worst possible time. 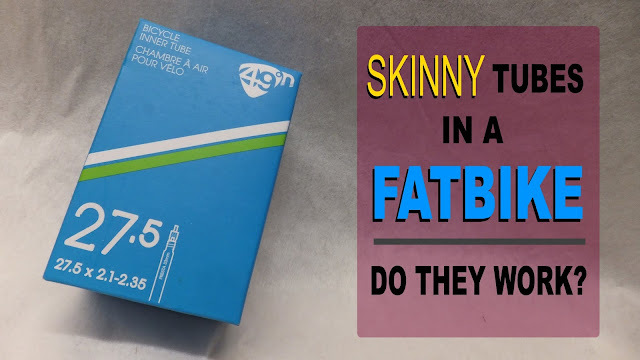 There is no argument that carbon anything is more expensive than alloy cousins, but lets not forget that a sprinkling of carbon on your fattie does increase the coolness factor by a notch or two. 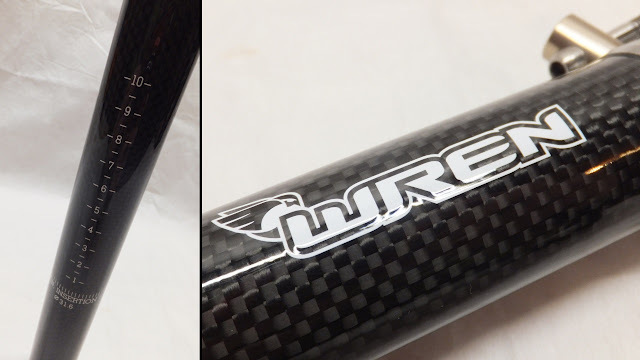 As mentioned previously, Wren Sports carry a selection of carbon goodies for the discerning biker including: bars, seatposts, bar ends, bottle cages, seatpost clamps and headset spacers. 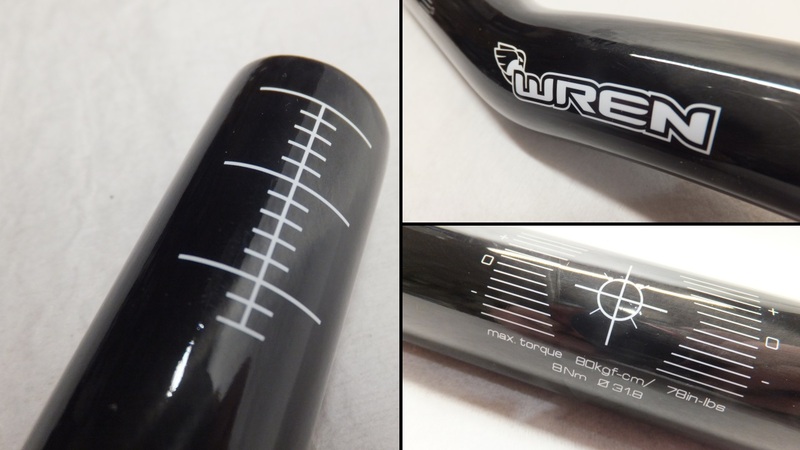 Wren Sports carry five models of carbon bars that vary in width, rise, backsweep and upsweep with four requiring a 31.8mm bar clamp and one needing an oversized 35mm. Weight ranges from 170 – 240g, but when trimmed to your preferred width they should be a tad lighter. 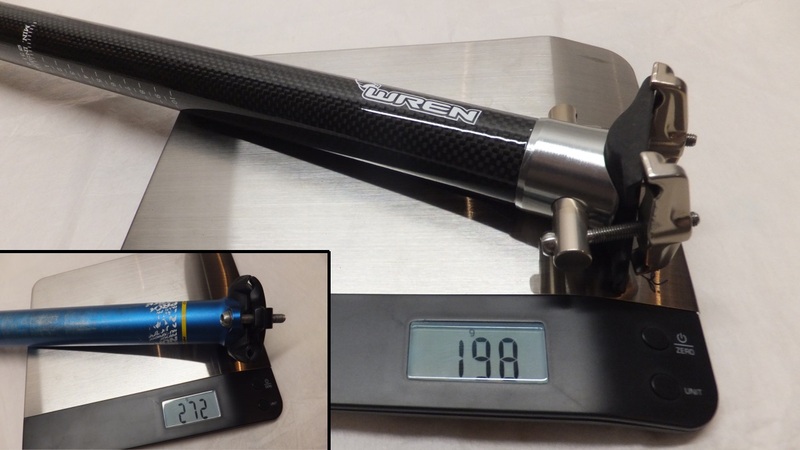 Wren carbon bars go through extensive two phase testing at the factory to ensure that what you are getting is a durable and quality product. Phase One involves a minimum 270kg (596lbs) of force up and down for 100,000 cycles and Phase Two is another 100,000 cycles with the load increased to 450kg (992lbs). That's some crazy extreme pressures to get that flexing . . . try doing that against your knee. Definitely some great numbers for fatigue and load testing. Fatbike Republic was sent a WHM350 with a 25 degree rise, 9 degree backsweep and 5 degree upsweep and a super wide width of 840mm. Wren carries three different models of carbon seatposts in diameters from 27.2mm – 34.9mm and lengths from 250mm – 400mm. Weights range from 167g – 188g when looking at the 350mm length version. Other differences between the three models include: carbon vs aluminum rail clamp, CroMo vs titanium bolts and offset vs straight. 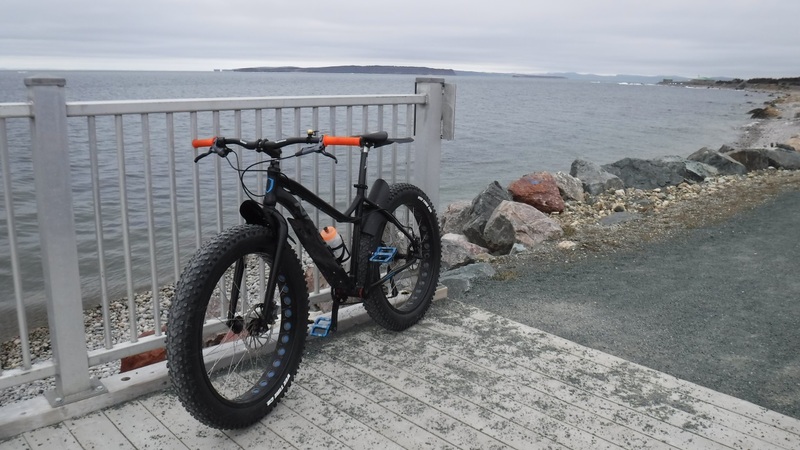 Fatbike Republic was sent a WSP650-316 with a 31.6mm diameter and 400mm length. 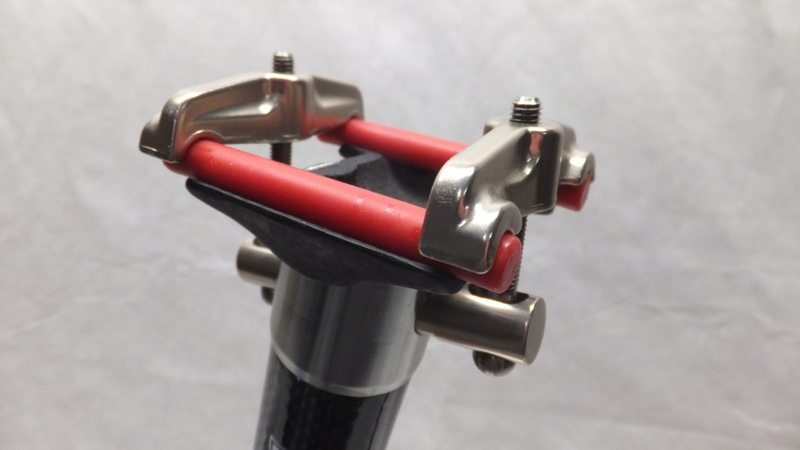 This model seatpost comes with the carbon fibre rail clamp, titanium bolts and is not offset. 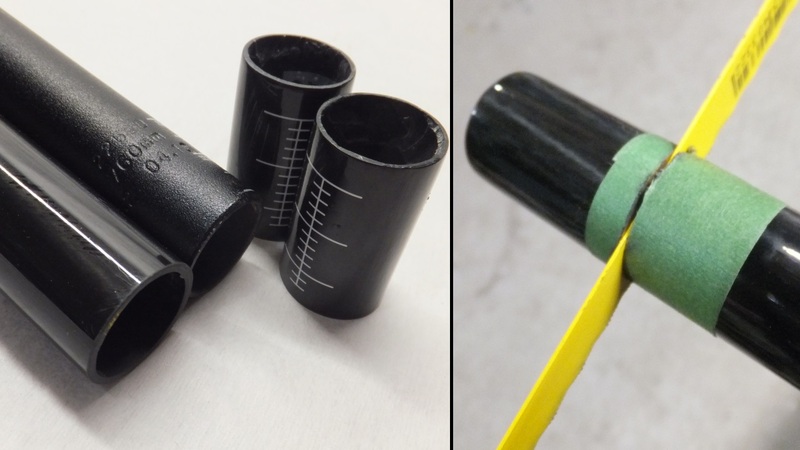 When it comes to carbon paste there are two schools of thought on using it when installing carbon bars and seatposts. One camp says to use it only if the bar/post slips and the other says to use it period . . . both recommend ensuring the aluminum mating surface is clean. I reached out to the folks at Wren and they sat in the second camp. Its better to use the carbon paste as it reduces the clamping forces needed to keep the bar/post in place. Nuff said. Taking a closer look at the WHM350 bars I noticed indicator marks on each end of the bar in addition centering and levelling marks in the middle. A couple of Wren stickers also adorned the shiny black goodness. Dropping the uncut bars on the scale they weighed in at a svelte 238g while the stock RF Aeffect weighed 330g. That’s almost a 100g savings. 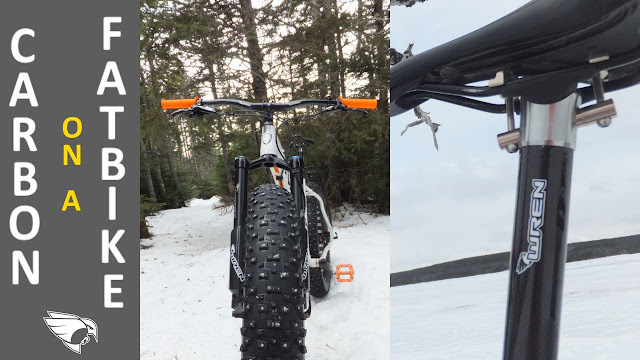 The stock bars on the Sasquatch 6.1 measured in at 760mm and the Wren WHM350 bars measured in at a whopping 840mm. Simple math would mean trimming 80mm (40 from each side). The folks a Wren recommended taping the end of the bar and use a 32T hacksaw blade to get the cleanest cut. After measuring twice and marking the bars I got ready to cut. At the last minute I decided to match up both sets of bars and noticed that my marking was off. I discovered that the RF bars were actually 10mm wider (770mm) than stated which meant that my 40mm cut mark needed to be adjusted to 35mm. Lesson learned . . . take your own measurements. I remarked the bars to 35mm, lightly clamped them in a vice, held my breath and started to cut. 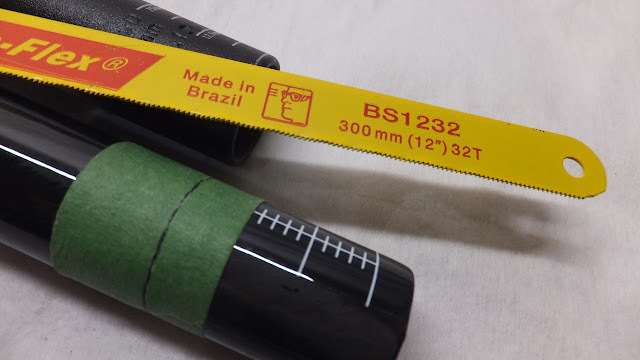 The 32T blade sliced through the carbon bars like butter with practically zero resistance and the marking around the full circumference of the bars helped keep the cut straight and clean. In a couple of minutes I had the bars cut, untaped and ready to install. Installation of the carbon bars was a straight forward process with the only consideration being the clamping torque which is 8Nm max. The WSP650-316 carbon seatpost is another thing of beauty with its carbon fiber rail clamp and ti bolts. As with most seatposts the minimum insertion depth is clearly marked at the base of the incremental measurements that run up the shaft. Weight savings amount to about 74g when compared to another aluminum 31.6mm x 400mm seatpost. 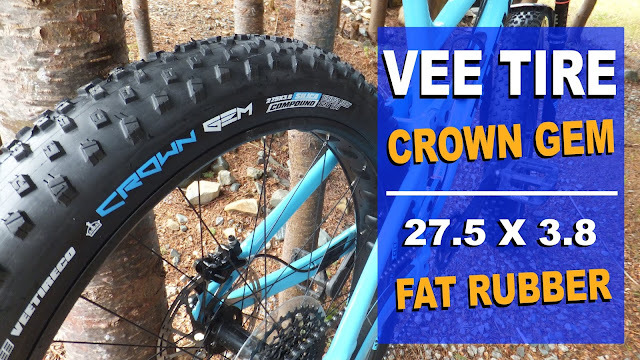 The Wren weighs in at 198g and the well used Nukeproof at 272g. As the Wren seatpost uses the traditional twin rail clamp design, mounting up your favorite saddle is easy. Prior to inserting the seatpost you need to ensure that any old dirt/grease is removed from the seat tube. Maximum clamping torque is 8Nm. After determining the appropriate seat height, the application of carbon paste provided a little extra grip that reduced the need for over tightening. With the bars and seatpost mounted up to the Sasquatch it was time to head out on the trails and see what the fuss is all about. The weight loss on the front end was immediately noticeable. 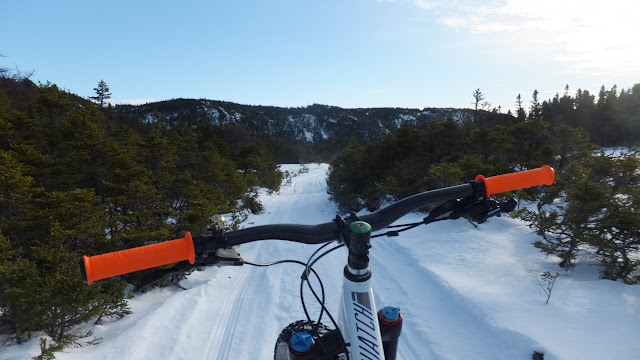 The WMH350 carbon bars actually made the bike feel lighter when loading up to head out to the trail, and on the trail with the bike seeming more lively. I did notice that during ultra frigid temperatures the carbon bars did not get as cold as aluminum and less cold transfer means warmer hands. This should also hold true for heat transfer if you live in warmer areas. These bars are tough as well. I did take a rather nasty over the bar tumble and laid down hard (on the bar end) during a failed high speed maneuver on a frozen lake. Neither event damaged the bars. Running on smooth snow it was a little more difficult to notice the vibration damping, especially when running low psi and a suspension fork. This changed when the bars were swapped to a rigid front end, higher psi and a dirt medium. 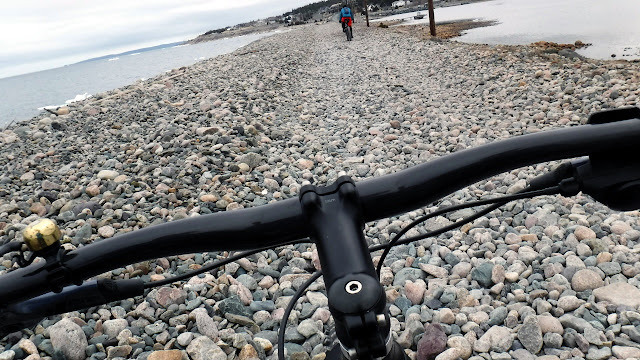 The bars seemed to transmit less vibration during a 30km gravel grind with multiple 200ft sections of fist sized rocks. 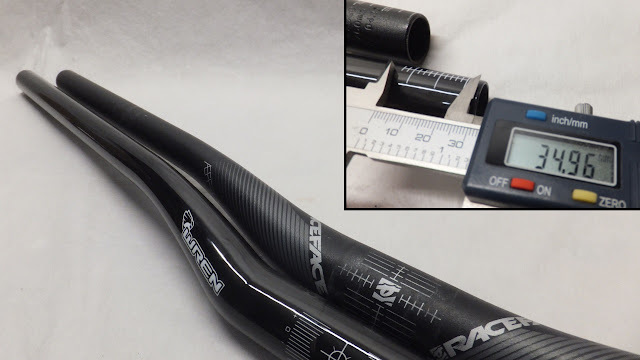 The impact of the weight loss from the WSP650-316 carbon seatpost was less noticeable than the bars. Riding on snow with a squishy rear tire the seatpost did not feel much different than its alloy cousin. Increasing the tire psi and switching to dirt, the seatpost felt as if it took some of the "sharpness" out of the same 30km ride. While not in the same category as a Thudbuster, the WSP650-316 did have a subtle difference over what you would expect from an aluminum seatpost. To ensure the proper clamping torque I initially used a standard seatpost clamp, but later swapped to a quick-release to make mid-ride adjustments less of a pain. Dropping and raising the carbon seatpost was trouble-free and slip-free when using carbon paste. 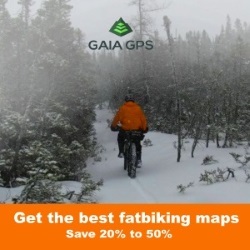 Bikepacking is a quickly growing sub-segment of fatbiking where you strap camping gear to your fattie and head out into the wilderness. Much of this gear is strapped to the bars and seatpost so as to maintain maximum mobility. However, several carbon manufacturers indicate that their bars and seatposts are not bikepacking friendly. 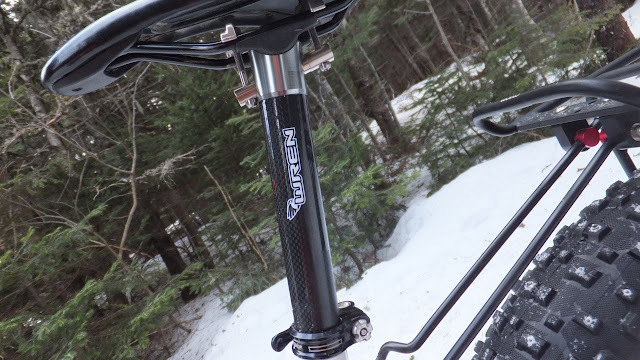 Wren Sports carbon bars and seatposts seem tailor made for bikepacking. The handlebars are rated up to 450kg load. The key is the maximum clamp torque which is 8Nm. If the clamps used to support the bags/bikepacking equipment can hold with a maximum of 8Nm of torque, the handlebar can easily manage most bikepacking gear. 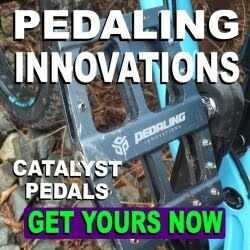 According to the folks at Wren, when running a seatbag the forces are primarily applied to the seat rails with little leverage against the seatpost. The seatpost and rail clamp are designed to handle loads from people sliding off the seat and putting load on the back of the saddle. In other words, seatbag . . . no problem. Wren Sports are not worried about their carbon bars and seatposts holding up to adventure riding. 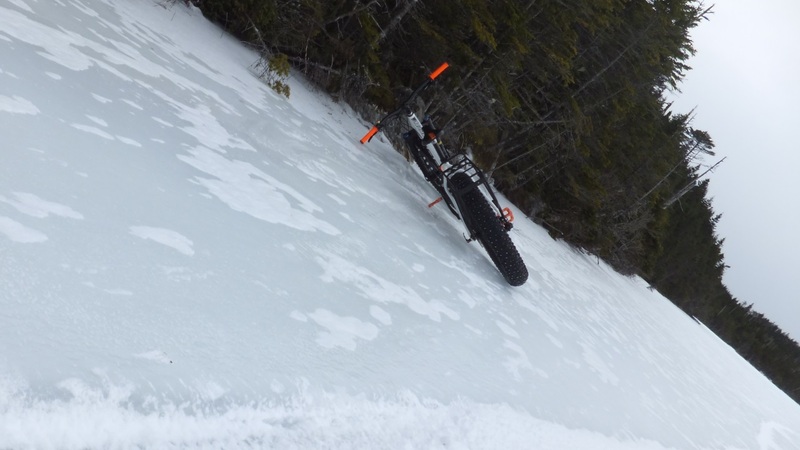 If not, then you can still have plenty of fun on your fatbike without those ultra light carbon bits. But then the question becomes do you want carbon as it does offer benefits and is rather cool? Either way . . . need or want . . . be sure to check out Wren Sports for their line of carbon bike accessories.